In my last blog post, I promised that I would discuss the importance of coral reef fishes’ colors and patterns. So, this post will be entirely about reef fish! First, I’ll share some research that examines how coral reef fish see color. Then, I’ll talk about why colors on coral reef fish are ecologically relevant, in terms of mating, camouflage, signaling and more. Finally, I’ll talk about how colorful coral reef fish can be affected by coral bleaching. As a refresher, coral bleaching occurs when corals get stressed and expel their symbiotic algae, which contain photosynthetic pigment. Just like other classes of life boast incredible diversity, reef fish are diverse too! As one example, reef fish can be diverse in how they are able to see color. Some fish species have a single photoreceptive cone (monochromatic) and others have up to four different types of cone cell, which each have different absorption spectra (tetrachromatic)1. Reef fish usually have two or three types of cone cell for color vision. For all fish, but especially predatory fish, what colors are, and are not, visible can determine how successfully they hunt for food. A study by Cheney and Marshall explored the perceptual ability of predatory fish to distinguish between a fish (called a model) and another fish that looks like the model (called a mimic). Fish with more distinct cone photoreceptors were shown to outperform fish with fewer cone photoreceptors when distinguishing between a fish and a mimic2. Another study published in The Journal of Experimental Biology assessed the visual capabilities of the Picasso triggerfish, Rhinecanthus aculeatus1. The researchers tested how triggerfish would respond to a choice between edible stimuli, either colored or gray. They made sure to control for differences in luminance, which characterizes brightness, that the fish might use to distinguish stimuli instead of the intended color cues. Some of their experimental results are shown below. The researchers found that fish were significantly more likely to choose a colored stimulus over gray distractors (Figure 1). This finding held for all colors tested, including blue, orange, green, yellow, and red. These researchers also found that fish showed a preference for red stimuli. Preference was approximated by the first colored stimuli pecked by a fish21. This study, and others, not only show that coral reef fish can see color, but that the ability to distinguish between colors is beneficial for predatory fish. Figure 1. 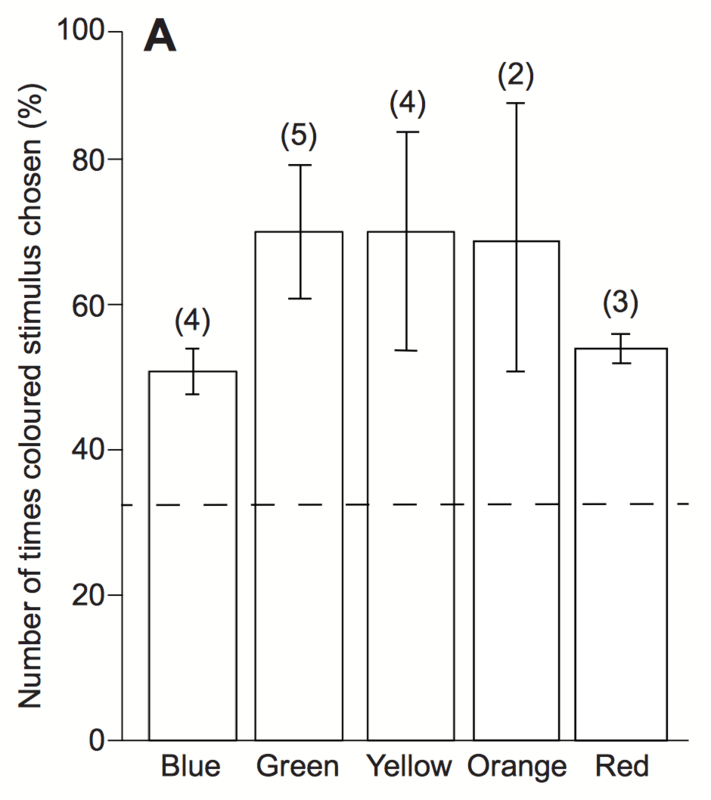 This figure shows the number of times, as a percentage, that fish in the study chose the colored stimulus over two gray distractors. The dashed line represents the 33% threshold value if fish were randomly choosing stimuli. 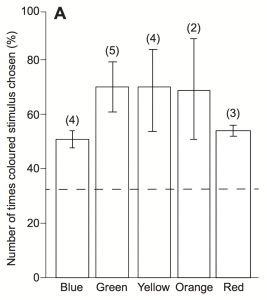 For all colors, the fish chose the colored stimulus more than the gray distractors. The ecological relevance of reef fish coloration and color vision has been of interest to the scientific community. Coloration may play a role in mate recognition, visual warning for predators, displays for reproductive potential, or as camouflage3. Mimicry is also achieved through coloration, as shown in the Cheney and Marshall experiment above. Moland et al. also researched mimics, and contend that mimicry is “a widespread and common phenomenon in coral reef fishes”4. The contrast, or lack of contrast, in color bands or patches on fish can be important. Bright, contrasting coloration can warn predators that a fish is poisonous. Large spots on the tails of prey can serve as “fake eyes” which mislead and misdirect predators23. Camouflage on coral reefs has been a prominent focus of scientific study. 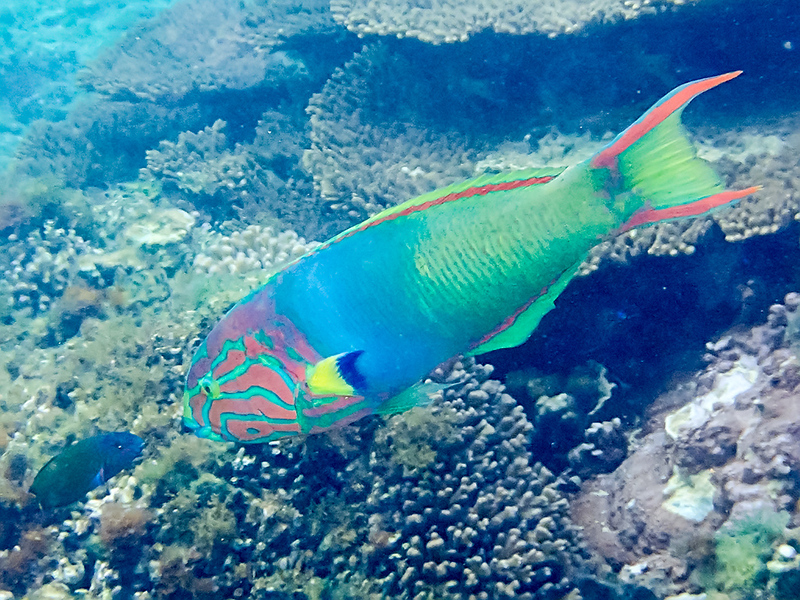 Some species of fish, like the moon wrasse (shown below), appear super colorful up close, but the patterns and colors blur when they are seen through water or from far away3. Also, the ideal colors for visual camouflage vary with depth and environment. In deep water, all colors other than blue appear blue or black because long wavelengths of light are preferentially absorbed. Thus, being bright red or orange is an effective form of camouflage in deeper water3. Logically, it makes sense that coloration that camouflages into the surrounding environment can help prey confuse or escape their predators. When the reef environment changes, fish that depend on camouflage for survival become more vulnerable. Coker et al. 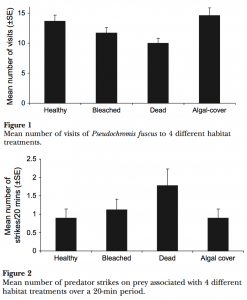 published a paper in Behavioral Ecology showing that coral-dwelling damselfishes are more susceptible to predation when they are associated with dead and bleached corals. Predation rates on coral-dwelling damselfish were found to be 17% higher on bleached or dead coral colonies5. 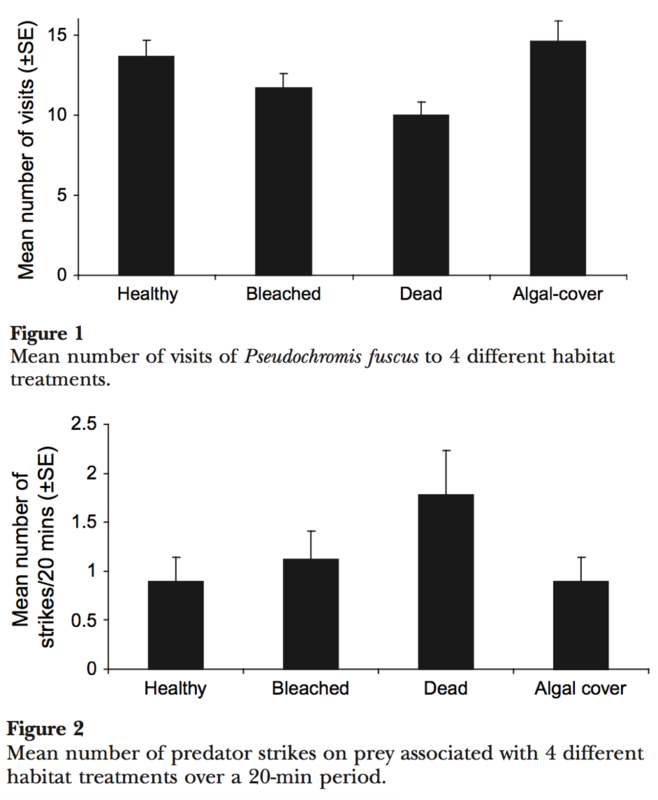 In the figures below, you can see that carnivorous fish, Pseudochromis fuscus, visited healthy and algae-covered reefs most often (Figure 1 below) but made the most predatory strikes on dead coral (Figure 2 below). Damselfish on dead and bleached coral were thus most vulnerable to predation. Figure 3. Within a 20 minute period, researchers monitored the number of visits and predatory strikes by Pseudochromis fuscus on damselfish. The dead coral and bleached coral were the habitats with the most predatory strikes, despite being the habitats visited the least by the predatory fish. This paper highlights yet another reason why we need to protect our reefs as best we can against bleaching. Coral bleaching can have cascading effects on all parts of the coral reef ecosystem, in this case, damselfish are negatively affected. Reef fish aren’t colorful just because it looks cool! There are many ecological explanations for reef fish colorations and there are often advantages accrued by colorful fish. Reef fish are an exciting and important part of the coral reef ecosystem. Tune in soon for the last installment of my colorful coral reef blog! 1 Cheney, Karen et al. “Colour vision and response bias in coral reef fish.” The Journal of Experimental Biology. 10 July 2013. Web. 19 March 2017. 3 Sheppard, Charles R.C. et al. “The Biology of Coral Reefs.” Oxford University Press. 2012. Print. 4 Moland, Even et al. “Ecology and Evolution of Mimicry in Coral Reef Fishes.” Oceanography and Marine Biology: An Annual Review. June 2005. Web. 21 March 2017. 5 Coker, Darren J. et al. “Coral bleaching and habitat degradation increase susceptibility to predation for coral-dwelling fishes.” Behavioral Ecology.19 August 2009. Web. 19 Feb 2017. This entry was posted in Uncategorized and tagged 2017, camouflage, color, coral bleaching, Coral Reefs, fish, Sarah. Bookmark the permalink.